If you require assistance with your garage, you have come to the right provider! 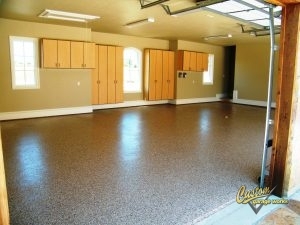 Known for our professional garage floor coating in DeSoto, TX, we originally began our company in 2003. We wanted to create the ultimate garage, and when we could not find what we wanted in the industry, we decided to create it ourselves. Presently speaking, we are able to provide our clients with some of the greatest garage storage solutions on the market, along with floor coatings that are tougher and more durable than traditional epoxy. We are dedicated to excellence, and we are passionate about providing excellent garage floor coating and custom garage solutions throughout the DFW area. Rising in popularity with each additional year, our garage floor coating in DeSoto, TX is among the best you can find in DFW. This coating is so popular because it is both more durable, and cures quicker than traditional epoxy. Unlike epoxy that can yellow in the sun, and peel or fall off over time, these coatings are stronger and more resilient. In addition to our floor preparation, which includes professional diamond grinding, as opposed to acid etching, the end result is a showroom quality floor that is simple to clean, and practically indestructible. If you are interested in hearing more about our garage floor coating service, you can schedule your free estimate when you call 214-494-9068 or 817-308-1305. When you are running out of space in your garage, Custom Garage Works has the right garage storage and organization solution for you! Your garage looks greatest when it is clean and organized. With products such as garage cabinets and overhead storage racks, we have a variety of options for our clients’ garage organization requirements. We provide some of the most resilient overhead storage racks in the industry, and our garage cabinets are specifically designed for garage needs. 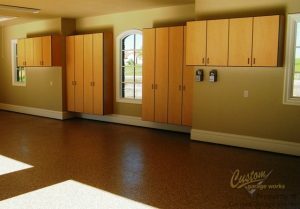 We are committed to helping our clients obtain the perfect garage floor coating and organization for their requirements and budget, and we look forward to serving you! Car Lifts Are you almost out of space for your vehicles? Our garage auto lifts can assist you! And More! Do not be worried by clutter in your garage any longer. We have the organization products you need!